Struggling to get the NMR or bridge playing music from ROON core. However no problems with it running off jriver. Jriver see's the device as Audio Renderer 19, roon see's nothing. Roon had no problems finding/playing through the SBT as an end-point. My system is the same as the picture below (courtesy of PSaudio). I understand the differences between Jriver and ROON. Though can't see why the ROON core can't see the Network Media Renderer, but can see the SBT ? It would be nice to run comparisons. Not sure how comparable when one will run with Jriver (may try foobar2000; wonder if anyone sorted out a decent app remote) against the SBT with ROON (which is leaps and bounds beyond Logitech Media Server). Guide to Network Audio and PS Audio article about Fixed v Packets (source of picture). Simon, how did you have the renderer setup ? Sorry to read you are having a hassle with Roon. Pity it is Easter or we could get Maro to communicate with the NMR manufacturer in Switzerland. As you are finding it works fine on Jriver. I have never used Roon, primarily the price put me off and the marketing excercise "Roon Ready". Ill wait to read how Simon evaluated it. As I read the feedback, Roon will only work with equipment that incorporates the ability to work with Roon "RAAT". ie that is Roon Ready ? Some manufacturers claim to do this as they and Roon scratch each other backs to make money ? What happens if you buy Roon and find your existing equipment is not RAAT compliant. Ianmac wrote: Sorry to read you are having a hassle with Roon. Thanks gents, that confirms what I thought. I do have jriver on my office pc / system which is on a different floor to my HiFi. Will invest in jriver remote and run the renderer that way. It looks like the NMR only supports UPnP/DLNA like most surround receives and MPD. Here is what Roon has to say about UPnP and why they do want to support it. Ianmac wrote: Some manufacturers claim to do this as they and Roon scratch each other backs to make money ? What happens if you buy Roon and find your existing equipment is not RAAT compliant. You can add Roon support for very little money RPI+digi IO. So that is not a problem. 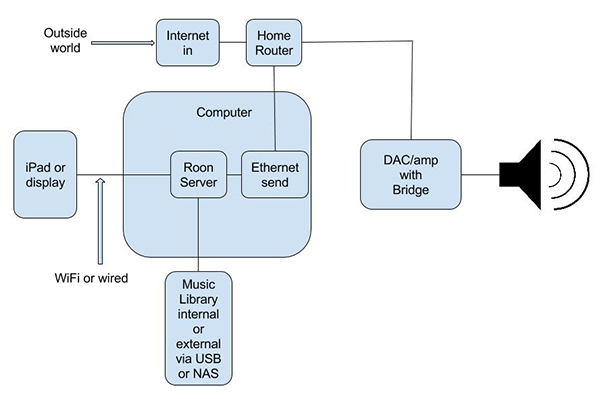 The RoonReady certification is mainly for DACS+streamers in same box. I think Roon is very transparent in their marketing. It is your choice if you want to buy into high margin RoonReady hifi or build your own endpoints and servers with RoonBridge and ROCK (Roon OS) for FREE which does exactly the same as the branded boxes. Thanks for the feedback and the links. Coming from a few years with MM then Caps streamers running their local SSD/music using Jriver and Jremote UPnP DNLA is a learning curve but I have no operational issues using Jriver and Jremote with my 1st NMR. The LINN factory is only a few miles from me so Ill be up at one of their open nights and have a chat with some of their engineers about the Linn viewpoint. Roon Ready network players from our partners have Roon’s high-resolution streaming technology built right in. Thanks guys. This thread was to make sure I wasn't screwing up. Last ditch thought switched off all the media type programs running on my synology; media station, audio station, etc. No effect. To get the SBT recognised by roon as an end point, logitech server has to be turned off. I've always genuinely enjoyed jriver and been running since the mms. After the demise of my mms, I ran jriver on my touchscreen PC which works great in Artist mode. Roon's UI as Rune says is nothing to be sniffed at. Its exceptional listening to an album; looking at recommendations while reading history and tenious connections. I've found myself in the darkest area's of my music collection, original listening to something light and fluffy. Also I suspect ROON picked up the performance of the SBT, though not something I've done any for of A/B testing on. It would have been nice to run both jriver and roon on the renderer. Jriver remote on iOS is better than iPENG for the SBT. Back to giving the renderer a good listen too and so far I'm impressed ! Guys did anyone have issues with 24bit coming through from jriver (I am assuming that everyone ran jriver). According to jriver and the remote the program is 24/88.2; but the dac states 16/44.1 (in its way; displaying the freq of 44). Via the SBT, no issues the dac see's it as 24/88. Other issues I've noticed and tried to address with no luck. None of this happens with the SBT running either logitech server; running on NAS or ROON (core on same computer as jriver - library on NAS). 1. Couple of drop outs over six hour period. 2. Remote losing sync over a matter of minutes, needing to reconnect. 3. Volume from the NMR is noticeable quieter. These are probably all jriver issues due to running it over a network. I've only run jriver (library on a NAS or server) on the PC direct into the DAC. So I maybe missing some tricks and tweaks. Any advice appreciated as I would like to hear the renderer at its best.